This is a photo of LBJ when he entered office. Video of LBJ addressing Congress after the assassination of JFK– This is a video of LBJ addressing Congress after the assassination of JFK. We chose to show this video because LBJ became president after the assassination of JFK. Lyndon B. Johnson was born on August 27,1908. He grew up in central Texas. He got married in 1934 to Claudia Taylor. In the 1960 campaign LBJ was JFK’s running mate, he was the elected as Vice President. The Great society was a social reform that attempted to end poverty, promote equality, improve education and protect the environment. The Great Society was also known as the “War on Poverty”. Education reform was also an important part of the Great Society.Johnson passed the Higher education act. Urban renewal and conservation was the third major part to the plan.LBJ’s re-election was a landslide victory against Barry Goldwater, it added momentum to the Great Society reforms. 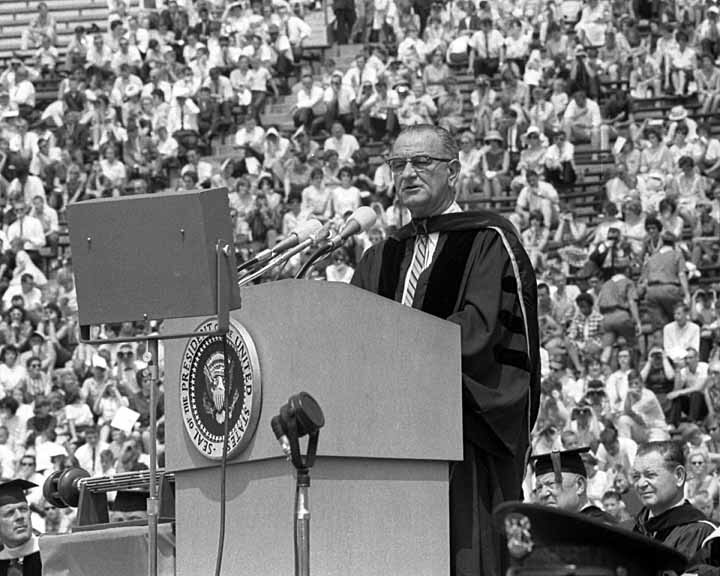 This is a photo of LBJ giving “The Great Society” speech. Lyndon B. Johnson first came into office after the assassination of John F. Kennedy. Johnson was able to provide stability to America after Kennedy had died. Johnson was able to affect America by passing many legislations. Many of the legislations that were passed under Johnson were designed to protect the nation’s land, air, water, wilderness, and quality of life. He also had administrations passed to aid education and he passed Medicare and Medicaid programs to aid health insurance. Lyndon B. Johnson signed the Civil Rights Act of 1964. The Civil Rights Act affects America because it outlawed discrimination based on race, color, or national origin. The Great Society, also know as the “War on Poverty”, was one of Johnson’s initiatives. Poverty rates significantly declined during the “War on Poverty”, hitting in all-time low in 1973. The greatest impact The Great Society had on Americas was the standard of living. Many of the programs that were implemented in the Johnson administration have since been dismantled by conservative leaders. This is a photo of LBJ and Martin Luther King Jr. discussing Civil Rights. The reason we are still learning about LBJ and the Great Society because some of his legislations that he passed are still in use today. For example, Medicare and Medicaid are still in use today. Medicaid and Medicare are two governmental programs that provide medical and health-related services. Both Medicaid and Medicare are beneficial today because they provide us with vaccine and hospital services. The Great Society influenced major programs such as social security,social insurance, disability insurance, and medicare.These programs are still around today and have great affects on us. I really enjoyed your post. I liked how you included information about LBJ’s background in the beginning too. I really liked your pictures, especially the one of LBJ and Martin Luther King Jr. I also liked your now what section because it explained all about LBJ’s legislations. I liked that you were able to cover such a broad range of topics in this post. Talking about things ranging from the, “Great Society,” to the Civil rights act of 1964. There was also some good background information about who LBJ was. However, there were some basic grammatical and spelling errors. Also, the post would benefit from more detailed information about each topic. The main thing that I took away is that even with the assassination of JFK the country kept moving forward and was able to still get things done. I enjoyed reading your blog post about LBJ and the Great Society. A lot of times reading about laws that our president passed confuse me. However, you guys explained the laws in great detail in a way that made it very easy to understand. From your blog post, I learned that Johnson was the president who passed Medicare and social security. I cannot imagine not having these things and not hearing these terms on a daily basis. It seems to me Johnson was an essential president that really influenced how we live today. For example, he signed the Civil Rights Act. I cannot imagine going to a segregated school for white students only. However, with Johnson as president, he helped shape our society today and made it possible for students like me to not know what going to a segregated school would be like. I also love the video you chose because it shows Johnson was ready to bring stability to our country after such a tragic loss. Overall, I would make no changes to your post. Great job! What I got out of this post was that even with the assassination of JFK, America kept moving forward in a positive direction under LBJ. America was faced with a lot of adversary during the 60’s, and you covered how LBJ played a part in it greatly. I enjoyed that you all included a thorough background on LBJ’s life before he became President. I also enjoyed that you provided a short, but descriptive video of LBJ addressing Congress. I recommend that you re-read your paragraphs before submitting. There were a bit of grammar mistakes that I saw. I learned that without The Great Society we would not have medicare today. Also, I learned that without the Great Society there wouldn’t be social security, which is very necessary for people today. I like how you all included a very in depth background of LBJ before he came president. I also like your videos and pictures to help explain the importance of Lyndon B. Johnson in the 1960’s. The only recommendation I have is that you check your spelling and punctuation. I take away from your blog post that without the Great Society we would not have Medicare or a type of social security. I also did not realize that Lyndon B. Johnson and the Great Society had such a big impact on America during the 1960’s. Overall I think you did a very good job.